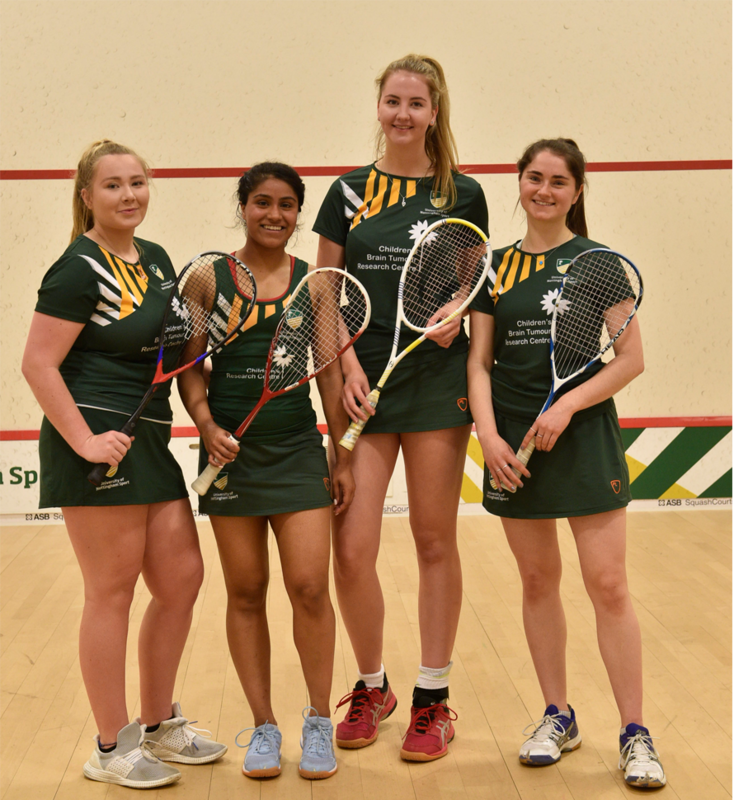 As a performance sport, the University of Nottingham squash confidently secured three of their teams into the final at BUCS Big Wednesday. Both the trophy teams, men and women’s as well as the women’s championship team. First up were the trophy finals where the #GreenandGold were represented in both the men’s and women’s teams. The Women’s trophy team were prepared to defend their title, that was hard earnt last year in a 4-0 win. There were some new faces in the team this season, but they were feeling confident after finishing top of Midlands 1A league and a 3-1 win against Durham in the semifinals at home. It was Edinburgh that they were to face in the final today. Off to a strong start, Sarah Boardberry, Aisling Guerzon and Ayesha Bhatti won their matches without losing a set, 3-0, this alone secured the trophy win over Edinburgh. Last to play for the women’s team was Emma Gill, she won her match 3-1 and was crowned BUCS Player of the Match in the women’s trophy- a great achievement at her first BUCS Big Wednesday. The overall result for the women’s fixture was a 4-0 win over Edinburgh. The men’s trophy team had a long journey to the final, after travelling away to Aberdeen and Glasgow in the preliminary stages. Therefore the #GreenandGold team were excited and relieved to be at home in David Ross Sports Village for the finals today. The men’s team were aiming to defend last years trophy title in the final against Newcastle. The #GreenandGold got off to a flying start with Julian Standish and Nick Ranynarjah winning the first two fixtures, 3-0. In his final BUCS Fixture at University, third year, Ben Windle won against Newcastle to secure the second trophy for #GreenandGold. This performance also secured him with the BUCS player of the match for the Men’s Trophy. With the win guaranteed there were still another two matches left. Nick Harbour and Lawrence Green went head to head against Newcastle in games for pride, as Nottingham aimed to create 5-0 scoreline for the team. Both #GreenandGold competitors remained focused to deliver the result they wanted. Closing the match with Nottingham dominating Newcastle in a 5-0 win. Our ladies Squash Championship team walked into David Ross Sports Village with defending their championship title on their minds. They have been the best team in the country since 2016 and they weren’t planning on losing that. The team of five remained relaxed and supported their Trophy teams to victory in the morning. In the semi-final, the experienced team won 5-0 at home against Northumbria leaving only Edinburgh in their way of a fourth championship title. The crowds gathered, in anticipation, to the all-glass squash court to watch Nottingham’s all-scholar side in the Championship. The #GreenandGold started strong with Josie Barker and Hana Ramadan winning both their games confidently 3-0. Last year’s club president, Libby Corke, was up next the match was competitive and Edinburgh managed to get a set in the third game but Libby brought it back in the fourth game to finish 3-1. 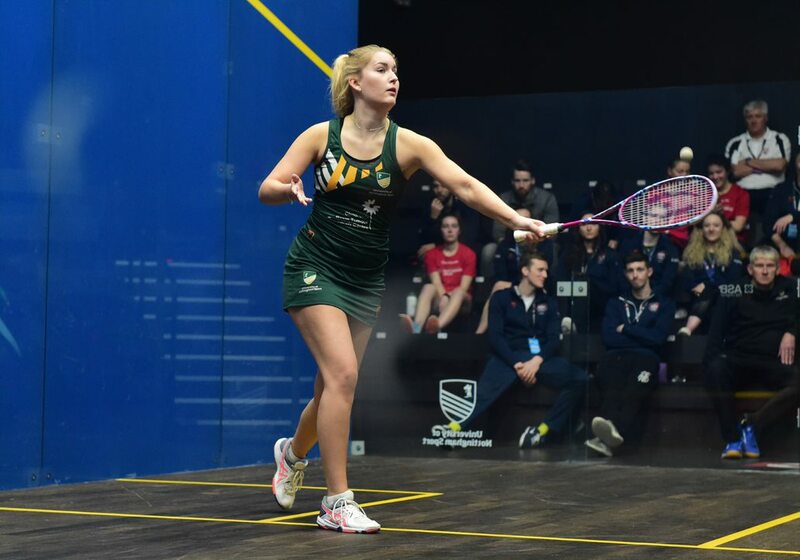 Libby’s match confirmed an overall Nottingham win in the Championship, making Nottingham the best team in the country for the last 4 years. The #GreenandGold captain, Hayley Openshaw-Blower, was up against a strong Edinburgh player. Hayley was happy with her performance, aware the Edinburgh player was a strong threat. The match went to Edinburgh 0-3 scoring their first point in the championship. 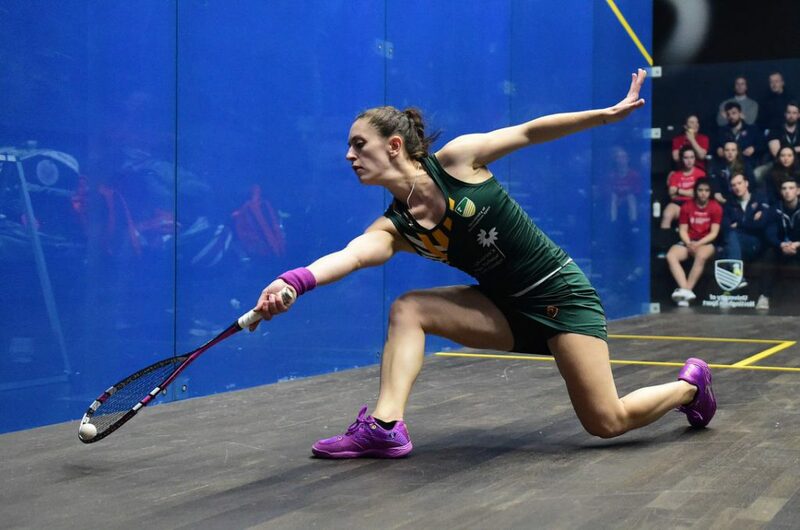 Coline Aumard, currently ranked number 2 in France, closed the championship for the #GreenandGold. 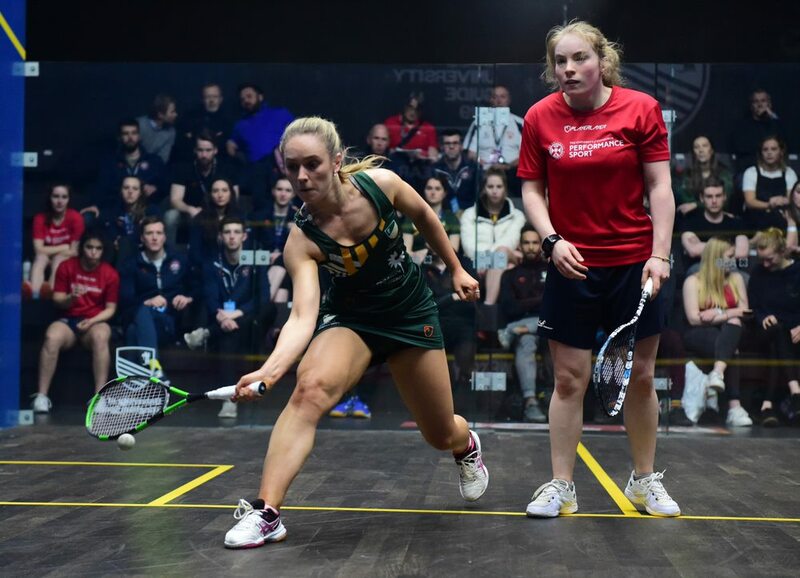 Her experience playing top-level squash in front of a crowd showed with her Edinburgh competitor not able to keep up with her pace, she won in 3 sets, 3-0. The University of Nottingham won the championship for the 4th year in a row, 4-1. The Nottingham club stayed supportive for the duration of the matches in the squash hall today to help the athletes secure all three finals finishing in gold.